We are a voluntary non-profit group of concerned local people working, in partnership with the London Borough of Bromley and others, to influence local decision makers in a positive manner. 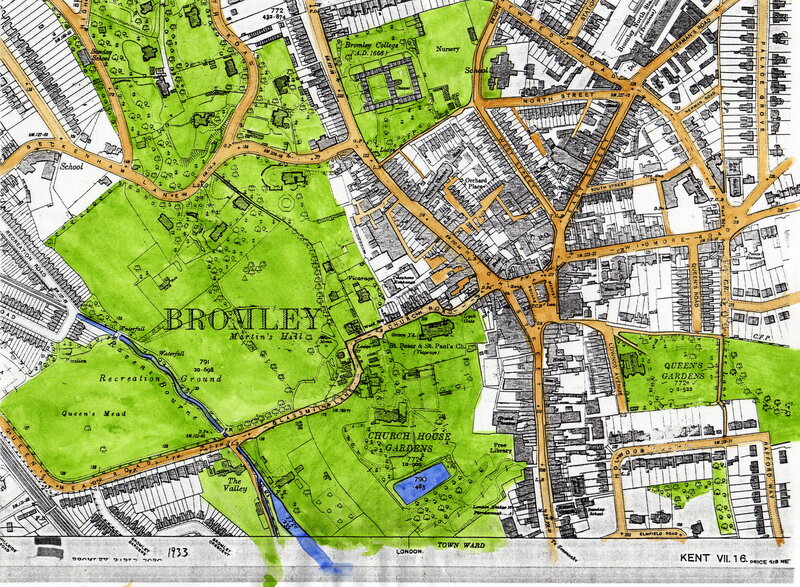 The objective of our organisation is to secure the preservation and enhancement of the parks and gardens adjacent to the centre of Bromley and which are environmentally contributory to the Town Centre Conservation Area; namely Library Gardens, Church House Gardens, Martins Hill, Queens Mead, Queens Garden, College Green, and Bromley Palace Park (aka Civic Centre grounds). In addition the Friends are interested in areas adjacent, in particular the wooded slopes and verges of Beckenham Lane, the Valley School Field and Grounds, The ‘Bromley Oak’ and landscaped verges of Kentish Way, plus the Mill Pond (off Glassmill Lane). Our parks shown in green. Parks are not currently a statutory requirement for local councils and therefore at risk. You can make a difference to the future of our public green spaces. This can be either in an active role or just as a supporter of our aims. If you live locally please support us by becoming a member and help make a difference. Our group is one of a large number of similar Friends groups committed to other public parks and green spaces in the London Borough of Bromley. For more information look at the Friends Forum website.